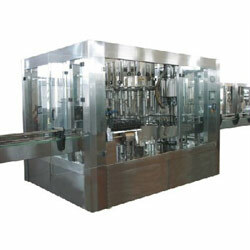 This machine is mainly used for wine and sauce filling operation, this machine is combined of rinsing, filling capping; the whole procedure is full auto, and suitable for glass bottle and aluminum steal-proof caps for filling vodka, wine,sauce and etc. The applicable bottle type can be adjusted freely and conveniently. That is why the machine has more capacity and benefit compared other machine with same specification.this machine is adopted advanced programmable PLC, and make the machine running auto, and bottle input conveyor adopts transducer with speed adjustable, and bottle output conveyor adopts speed adjustable motor. Cooperation with transducer of main machine makes the bottle running smoothly and reliably, it is convenient to operate with high auto because of every part of machine is inspected to run by photoelectric detector. The machine is idea-preferred equipment for beverage makers. 2. You can see more information in the file.